Lahore School of Economics, Lahore Pakistan and Bahcesehir University, Istanbul Turkey have agreed to establish long term cooperation in the areas of Faculty Exchange, Joint Research and Student Exchange. Dr. Shahid Amjad Chaudhry, Rector Lahore School and Prof. Dr. Suheyl BATUM, Rector Bahcesehir University signed the Memorandum of Understanding on May 17, 2006 at Bahcesehir University. Student should be able to compete for securing admission in the approved discipline as per the participating institution’s admission policy. Student should be enrolled in Undergraduate / graduate program. All applicants who secure admission will have an equal opportunity to compete for the scholarship according to financial needs. Last date for collection of Financial Assistance Forms along with supporting documents is May 29, 2006. M. Aslam of Lahore Chitrkar will perform in Main Campus Café on Saturday (May 20, 2006) from 12 to 2 PM. You are invited. 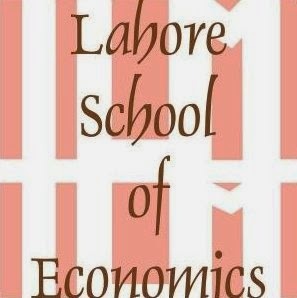 This is an admission season at Lahore School of Economics (Applications dead line: Jun 30, 2006). Students are looking for best university and making decisions to join best programmes that suit them. How can students and parents make an informed decision? Here is my suggestion. You are probably on summer vacations anyway. Why not visit LSE Campuses? Feel the environment, meet members faculty or listen to admission managers. After you have been there, you can make a more careful appraisal and more informed decision. 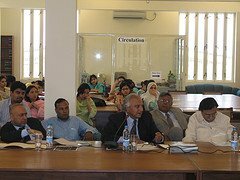 Team from Saudi Pak Bank visited Lahore School of Economics on May 17, 2006 and gave a presentation to graduating students. Mr. Asir Mansur, HR Head gave an introductory lecture on their Management Associate Program and after the presentation Mr. Babar Ahmed, the Vice President and Recruitment Head answered questions by students. FreeFullText.com provides direct links to over 7000 scholarly periodicals which allow some or all of their online content to be viewed by ANYONE with Internet access for free (though some may require free registration). The issue(s) which are available for free are indicated for each title on the alphabetical periodical lists. The design of this site is optimized for users seeking specific articles for which they already have the citation. If some of the articles you need are not available for free online, you may obtain them for a fee through a document delivery service, such as Pinpoint Documents. If you wish to "search" for articles on a particular topic, please use a bibliographic database such as PubMed. This site does not attempt to list ALL periodicals on the Internet, only those which offer free full-text content. Titles will be removed from this list if they cease to offer any free full-text content. Also see United Nations Common Library, Islamabad. Read full stories about Lahore School of Economics Second Annual Conference on the Management of the Pakistan Economy at: Dawn Nation The Daily Times The Daily Times The Daily Times The Daily Times The Daily Times and other national newspapers of May 3 and 4, 2006. Text of inaugural address by Tawfiq A. Husain, Deputy Governor State Bank of Pakistan at the Second Annual Conference on Management of Pakistan Economy at Lahore School of Economics. Pakistan’s economy continues to remain on a high growth trajectory during the current fiscal year, though the real GDP growth rate for the year seems likely to be lower than the 7 percent target. The expectation of the slowdown, relative to the FV06 annual target owes principally to the (estimated) weakness in the commodity producing sectors of the economy, the impact of which will be partially offset by an anticipated above target performance of the services sector. Here it is important to note that the forecast deceleration in economic activity during FY06 does not indicate a weakening of future momentum of the trend growth of the economy. With the substantial investments in the currents (and preceding) year, strong domestic demand, buoyant exports and a relative improvement in FDI (even after excluding privatization receipts), the economy is poised to deliver growth rates in excess of 6 percent through the decade, provided that progress is made towards removing infrastructural bottlenecks, implementing second generation reforms to improve institutions and governance, as well as to further liberalize the economy. Moreover in the short run it would be necessary to address emerging macroeconomics imbalances while these are still small and manageable. Some of the key macroeconomic imbalances include rise in the current account deficit, widening saving investment gap and a weakening in fiscal indicators (even after adjusting for exceptional earthquake related spending). Also, while inflationary pressures show a very welcome decline, there is a need to ensure that the downtrend persists in future until inflation rate comes down significantly. While inflation has declined from double digit near term highs in FY05 and is expected to fall to the 8 percent levels by end FY06, it must be recognized that reducing it further is necessary for a host of reasons. These include the need to encourage a rise in savings (by keeping real returns of savings positive), maintaining the purchasing power of incomes, making exports more competitive (by holding down the cost of production) etc. It is also important to realize that while the tight monetary posture of the state Bank of Pakistan, (supported by the government’s administrative measures) has contributed to a reduction in inflationary pressures, aggregate demand remains strong. During July-Feb FY06, private sector credit growth was a very substantial 18.1 percent –although weaker than the 25.3 percent rise seen in the comparable period of FY05, and while growth in large scale manufacturing also decelerated, this appears to owe more to factors other than a weakness in demand (e.g. capacity constraints, high base effects, technical problems, etc). In this background, a reduction in the rate of inflation and establishment of a clear downtrend will be important priorities for the State Bank, and therefore, there is a clear need to continue with monetary tightening. However, the monetary policy will need to be supported by fiscal prudence. While fiscal discipline had been good in recent years, there appears to be trend deterioration in fiscal indicators during FY05 and FY06. The revenue balance is in deficit in both years, and even the primary balance deteriorated significantly in FY06. Going forward, not only does the government need to maintain low fiscal deficits, these should primarily be caused by developmental rather than current expenditure. While development spending generates economic activity to pay off the debt, current spending only adds to the debt burden. The risk of a further deterioration in fiscal performance also needs to be guarded against. Some key risks include: 1) heavy dependence on import- related taxes, accounting for nearly half of the share in collections (receipts could therefore slowdown if, as expected, import growth falls back to historical norms); and 2) dependence on potentially volatile non tax revenues. Thus, there is clear need for further tax effort to raise the tax-GDP ratio substantially over the next few years. In this context, the reported plan of the CBR to seek a one percentage point increase in the tax-GDP ratio in the next five years needs to be vigorously implemented. Particular attention needs to be given to the broad basing of the tax net and improving collections from under-taxed areas of the economy such as agriculture, the services sectors, and stock market. Moreover, the mode of financing the fiscal deficit is also important. Borrowings from domestic sources other than SBP simply result in a shift of demand from the private sector to the government, but borrowings from SBP are more inflationary as they add to aggregate demand, and therefore financing of the deficit should be through a healthy mix of bank and non-bank borrowings. It should be recalled that the large Rs. 178.2 billion increase in budgetary borrowings from SBP during July-Feb FY06 was an important driver of monetary expansion in the period. A part of the government’s greater reliance on SBP borrowings was driven by weak non-bank receipts, but another contribution was also due to the non- issuance of long term government bonds; almost half of the Rs. 31.0 billion net retirement of government borrowings from scheduled banks was due to maturities of these instruments. It is important that the government make fresh PIB issues to lower dependence on SBP borrowings and to provide a market driven benchmark, which is needed for the development of the corporate bond market. While low inflation would help providing impetus to growth in years ahead, a disappointing level of national savings and low investment need attention. Specifically, during FY03 and FY04, imports were financed through current account flows. Unfortunately, thereafter imports continued to grow; the growth in non-debt creating forex inflows was no longer keeping pace with the growing needs of the economy. This is reflected in the widening current account deficit, and resulting in a raising savings-investment gap. This means, that in years ahead, the country will be increasingly constrained in its ability to meet the growing consumption and investment needs without generating inflationary pressures and an accelerated growth in the country’s debt stock, unless there are substantial policy revision and sustained reforms to meet the challenge of increasing both investment (to increase productive capacity) and savings (to fund Pakistan’s investment needs). One of the current economic issues facing Pakistan today is the sharp deterioration in the current account from a surplus of 1.9% of GDP in FY04 to a deficit of 1.4 percent of GDP in GY05 that has been, fortunately, financed by the high capital flows. The persistently higher oil price in the international markets is one of the key reasons for the increase in country’s import bills. Interestingly, imports excluding oil are also showing significant rise during recent years. Despite the easy availability of capital flows, it would be desirable to focus on current account sustainability. In this context, the recent increase in the current account deficit, though seems sustainable in the short run, as it reflects the increase in domestic economic activity (which would lead to a higher export growth in future) and also because it is financed by the low-cost external sources. But, in the long run, export growth must keep pace with the surge in imports. Unfortunately, the growth in imports, and therefore the current account deficit, cannot be easily contained. Data suggest that much of the growth in imports comprises of either capital goods or input for industries. Curtailing these directly would therefore result in significant fall in economic activities. Moreover, some further growth in imports is inevitable for a developing economy such as Pakistan, particularly as it seeks to address infrastructural shortcomings. The large current account deficit can be sustained in FY06, but hard choices will have to be made in future years, it continues to persist. The policy options available will revolve around reducing the need for imports by containing the growth in aggregate demand, promoting exports, and attracting non-debt creating flows (e.g. FDI). Less desirable options would be to und the current account deficits through a mix of privatization receipts and higher debt levels or a significant drawdown of the country’s foreign exchange reserves. Macroeconomic stability and strong economic growth during the last few years has enabled the country to show some progress in social sector development as well. In particular, the rising trend of the rate of unemployment since FY93 has been reversed during FY02-04, despite a faster growth in the labor force. Similarly the relative improvement in the fiscal position, through sustained efforts in recent years, has allowed the government to substantially increase spending in health, education and other social sector areas. As a result the positive trends in most of the social indicators have gathered pace during the last few years. However, the social indicators still do not show a satisfactory picture. It is, therefore, important to speed up the progress on human development in Pakistan, and the acceleration has to continue consistently to catch up with the backlog and meet the needs of new entrants. In this regard, the sustainability of macroeconomic stability and maintaining the current growth momentum remain essential. Moreover, the government should significantly augment development spending, increase efficiency of expenditures, and foster better partnerships with the private sector to improve delivery of services. The government’s efforts could be complemented by the increased access to financial services of the populace (especially to the until recently neglected SME and microfinance sectors). Now let me offer some comments on the future outlook of Pakistan’s economy: Current SBP forecasts indicate that real GDP growth will be in the range of 6.3-6.8 percent during FY06. Headline inflation (in terms of CPI) is projected to be in the 7.7-8.3 percent range during FY06. While the deceleration is certainly welcome, the downtrend in inflation needs to be firmly established to maintain macroeconomic stability. SBP will therefore continue to retain a tight monetary stance. However, it is important to note that monetary policy alone will not be able to contain all of the rise in inflationary pressures. In particular, there is an urgent need for the government to supplement its very laudable supply side measures with policies to address market structure problems. Specifically anecdotal evidence clearly suggest that in recent years, speculative hoarding and collusive price setting have been significant contributors to domestic inflationary pressures in markets for many key commodities. Such pressures respond more to legal and administrative measures, and are less sensitive to monetary tightening. In contrast to the welcome decline in inflation, the external balance has deteriorated significantly in FY06. Although remittances are expected to show reasonable growth and exports are likely to remain strong, the current account deficit is expected to increase to 4.7 percent of GDP by end FY06. While this is not low it is quite sustainable in the short run. In the longer run, however, large current account deficits cannot be sustained, as these would initiate a vicious circle of debt creation, exchange rate deprecation and inflation. Let me conclude by saying that given the fast growing trends of aggressive globalization and increasing regional competition. Pakistan, need to continue with sound macroeconomic policies, which are the lynchpin of restoring both domestic and foreign investor confidence. Macroeconomics management today is complicated by Pakistan’s need to continue growing which does require it to stretch its resource base, and the country will have to carefully gauge its priorities in seeking to meet these challenges.